This month for the Gabby Moms I received the spring issue of Eternal Encouragement magazine to review. This issue had a lot to do with Chaos: how it can be in our homes, and how to properly deal with it and get rid of it. CHAOS has been termed: Can't Have Anyone Over Syndrome. In this wonderful issue, Lorrie Flem, of Eternal Encouragement, and many other authors encourage us to deal with the chaos in our homes and our lives and practice hospitality, that often over-looked necessity of a Christian's life. This is not all that is covered though. Every issue of Eternal Encouragement magazine I have seen is packed full with encouragement, and real tips and advice you can use in real life. Some other topics covered in this issue are fostering hearts of obedience in our children, having the joy of the Lord, marriage when a husband and wife must be apart, cooking healthy meals for the family, and more. I also appreciate the size of the magazine, that fits easily in your hands. I was able to take it everywhere with me easily, to read an encouraging article here and there. 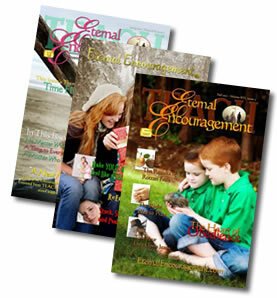 Subscriptions to Eternal Encouragement magazine are available printed and digital, and any subscription receives the NEW EE Etc. Web Magazine that is published 8 times a year. This has full magazine articles that are only available to Eternal Encouragement subscribers via a new online magazine website. I received a free copy of Eternal Encouragement magazine to review for The Gabby Moms. My opinions are my own, honest opinions. it is sad how hospitality is often overlooked.